Bright Box Theater – Sing for Your Life! « Bright Box Theater – Sing for Your Life! 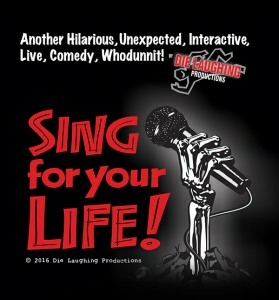 Die Laughing Productions presents Sing For Your Life, the world’s greatest live karaoke-themed Murder Mystery Comedy. You’re at a TV taping of Karaoke Krown, a show that chooses who will reign as King or Queen of Karaoke! But before someone takes the crown, someone takes a life. This hilarious, interactive whodunit is part TV singing show parody and part live karaoke night. Sing for Your Life stars 98 Rock’s Justin Schlegel, Rob Maher, Joe Robinson, Tommy Sinbazo and Erik Woodworth….and as always, YOU. We have speaking and singing parts available for all you wannabe thespians and crooners out there. Sing a song. Solve a murder. See you there.